The name Center of Enlightenment was gifted to Rain on the Earth and Annique of Gaia by Almine when they were seeking to establish a teaching center for Almine’s work, beginning with Belvaspata. At that time, we co hosted the radio show, The Fountain of Spiritual Healing about BVP as well as facilitated PODs (retreats) for Almine. We later co-hosted, Magic, Mystery and Magic, reading the works of Almine on the air. At the time, Annique also was a co-host on Almine’s French and Spanish radio shows. They also hosted their own show about alchemy in action, Medicine Walk Radio. The founding ceremony was held September 11th, 2010 for blessing and establishing COE was held at the White Buffalo Sanctuary in Bend, Oregon facilitated by Rain as Liaison for the Indigenous Peoples for Belvaspata and attended by Annique and her two daughters. 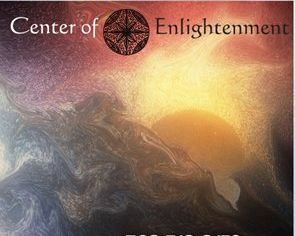 The founding principles of the Center of Enlightenment are: Far reaching vastness of vision, the Establishment of Sacred Government, Inclusive Sovereignty of Expression and the Cutting edge of Transcension and Beyond. In the beginning, the Center was located solely at Annique’s home, Koumbi Retreat Center in Hillsboro, Oregon where classes, sessions and workshops are held. Rain and Almine were given Almine’s endorsement to teach any of her work in recognition of their years of study with her. As Rain’s work as Liaison grew so did her commitments to travel and so COE entered a new phase which we have seen as a vesica piscis– a sacred vortex created by two powerful circles which intersect like an eye. Wherever Rain went this alchemy gives exponential increase to the work of both. At the end of 2014, when Almine went into stasis and it was clear it would be some time if ever she would return to be the focal point of the work, a great shift occurred among Almine’s students – the teachers and practitioners of the prolific cutting edge mystical material which came through her. She had called, the Pillars of the Temple to come forth to be trained to bring the work to humanity. It time for us all to step forward to fulfill our part- to give roots to her wings as she called. We see programs, webinars and websites springing up to do so, many offering to share with Almine a portion of their income to support her now when she can no longer support herself. It seems a natural progression for the Center of Enlightenment to take on an on line presence to be a focal point for all of this. A place to come for listings of classes and workshops, websites and webinars. And a place to find practitioners of all the different modalities of Almine’s work. For us to share rare information – from POD’s and retreats- recordings, photos, alchemy and more no longer available through Almine’s organization, Spiritual Journeys. Presently we are thinking of making a special password protected area for this which one can sign into. We’d like to offer your products here- things that you are creating taking the next step- especially putting forward works that will be of mutual benefit to you and Almine – sharing some of the profits with her. Rain is offering working booklets for doing Belvaspata sessions and presentations called the Belvaspata Companion and the Flipside. These are not intended to replace the BVP manuals they are bare bones work- convenient for the working practitioner with the basic information you need to do sessions in the Companion and the Flipside to do a presentation of BVP. These works support her work as Liaison and Almine with great gratitude as the source from which BVP came from the Infinite Mother. We welcome your contributions as well. So bear with us and help us in this process to make it a great success.